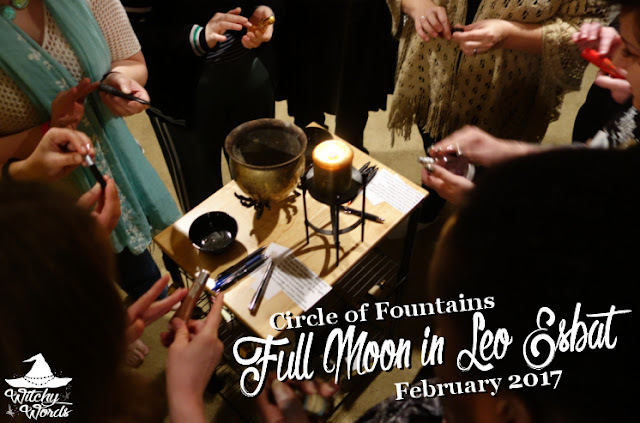 On Sunday, Circle of Fountains and our Novices met for the next installation of their class and our full moon ritual! The evening started with the class, where Amy and Andrea talked about energy work versus magic. Once their class was complete, they returned upstairs for ritual. This ritual I led. I've been placing an emphasis on the astrological sign that the full moon is in, so I planned out a full moon in Leo. Leo is all about drama and theatrics, so I placed an emphasis on rhyming in the ritual. I started by handing out six lines of a rhyming circle opening to individual members of the circle in order. I asked them to read the line as I passed behind them, cutting the circle with my athame. With your energy fill this place. It now resides within the moon. Some of the lines I handed to specific members. The second line is particularly Wiccan-influenced, so I ensured one of our two Wiccans had that line. They were otherwise handed out to whoever wanted one. We then called on the quarters, starting in the south because Leo is a fire sign. One tip for making quarter calling easier is to pin or tape the quarter calls by the wall of the element you're calling. This is something I did regularly with my last circle but seemed to have lost track of with this circle. I'm bringing it back for the esbats. I then left space for others to call upon any deities or spirits they'd like. Once that was completed, we moved on to spell work! I asked each of our ritual attendants to write down what they think courage and confidence look like. It could be a description or a drawing - whatever they were comfortable with. For some examples, one of our novices drew this adorable picture of a lion. I wrote "Holding your high in the face of adversity." One of our circle members said she was embarrassed to read hers aloud, because she wrote down that I exemplified courage and Kolika confidence. Abby, that's probably the biggest compliment anyone's ever given me. Once they read their paper aloud, I asked them to burn it and drop it in the cauldron. This gave us ashes charged with courage, confidence and fire for the next step of the spell. In each black bowl to either side of the cauldron, I placed a charged rose quartz for self-love. I then filled it half-full with a carrier oil (my choice was olive oil, but grape seed or avocado). I dropped in a little rose and patchouli essential oils into each bowl. Rose essential oil is great for love and beauty, and patchouli for sexuality and physical energy. I then added half the ashes to one bowl and half to the other, and stirred them to create a charging oil for self-love, courage and confidence. The only reason I created two bowls was to make it easier on everyone trying to reach it. A newfound confidence I ignite. There’s nothing I cannot overcome. With that, everyone had completed a simple glamour spell for courage and confidence! ... And released the circle! Simple, sweet and to the point. I hope you've enjoyed this simple full moon in Leo ritual! Until next time! I love your new haircut!! Thank you so much! I mostly just needed to get all those awful dead ends off. And in response to a comment that I think accidentally got removed, I totally plan on tackling other phases of the moon in various signs. I'm just focusing on full moons this year. Hopefully, within four years, I'll have a comprehensive set of infographs and can tackle the next set of correspondences. Thank you again!